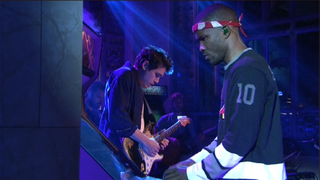 As promised, the R&B singer/songwriter Frank Ocean brought John Mayer to last night's performance on Saturday Night Live. The two performed on a stage surrounded by some arcade cabinets with nondescript glass and cabinet art, but they were running ROMs of real games in attract mode. It appears to be a big coup for Namco PR, whether intentional or not, as every game I could identify seems to be one of theirs. Tekken 3 was spotted right of Ocean as you face him. Tekken also is just right of Mayer (left of Ocean) on stage. Dig Dug can be seen, and there appears to be a Ms. Pac-Man/Galaga dual cabinet at far left. Things got strange in the second song, "Pyramids." During Mayer's guitar solo, Ocean blew on the microphone for a little bit, then walked over to the Galaga/Ms. Pac-Man cabinet and started playing. See for yourself in the video below while everyone from the U.K. complains in the comments that they can't watch it.